Raptivity - Rapid Interactivity Building Tool: Spark your Imagination by Attending our Webinar Series! What’s unique about all the webinars – three in total – is that they feature creative ways to use Raptivity interactions. We will showcase some really unique examples of using the Raptivity interactions you are familiar with. These webinars should ignite your interactivity imagination and show you how a little ‘outside-the-box’ thinking can go a long way with Raptivity. If you are ready to experience the versatility of Raptivity interactions, these webinars are a fun, easy way to do so. See highlights in the following table for featured Raptivity interactions. An exciting ending to the webinar series will showcase customer samples in the “Most Creative Use of Raptivity” contest. You will not only get to view customer samples, but you will cast an important vote to determine the winner. 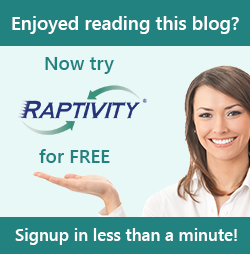 To register, go to http://www.raptivity.com/special-webinars for the free Raptivity webinars now!